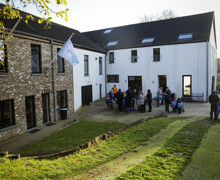 ISF (International School of Flanders) Tervuren is located in the quiet village of Vossem in the Commune/Gemeente of Tervuren to the east of Brussels. 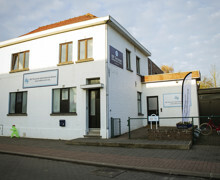 We occupy three buildings on Stationsstraat in Vossem, which are known by their original house numbers, No.1, No.3 and No. 6. Building No. 1 houses the classrooms for Years 1 – 6 and backing onto No.1 is the “Old Barn” which has been beautifully restored to provide a school hall and gymnasium for the whole school to use, as well as a lunch room downstairs. Building No. 3 houses the Early Years, made up of the Pre-school and Pre-Primary classes. The school library, as well as the administrative centre of the school with reception, finance and admissions, the Head of School’s office, staff room and community centre are all located in this building. I SF International Daycare is the latest addition to our campus and is situated in Building No. 6. This new project incorporates innovative design with scientific research into the well being of babies and toddlers. 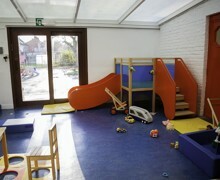 The Daycare has its own access point and outside space. Behind the two buildings are playgrounds and an expansive playing field, complete with a Wild Life Garden (including a pond), veggie patch, climbing frame and outdoor classroom. The Early Years has an extended outdoor environment attached to their classes at the back of No.3 where they enjoy enriched group activities, a sandpit and a wide range of gross motor equipment.